When I was 18, I had an encounter that got me noticing the phenomenon of robots replacing jobs in our society. And the sad part is how easily the person in this story let it happen. Well, little did I know, things weren’t going to be that easy. Every time (it seemed) I would walk in, there was always this one grumpy bank-teller who just looked disgusted every time I would approach the counter with my deposit slip and money. “You know …”, she’d say “there’s ATM right around the corner. You could just deposit the money in there instead of coming up here”. It was pretty obvious she did not want to do her job. An ATM? Nonsense. I was depositing money the way I had seen my Dad deposit money thousands of times before this. Why should I do anything different? The next time I stopped in, she told me the same thing. But this time she was more gruff about it. “I told you last time – you can just use the ATM if you want to make these kinds of deposits”. That was the last straw for me. I had had enough of this rude lady. After that day, I started going to the ATM instead. And you know what? It was kinda awesome! There was barely ever a line, and I was able to deposit my money in a fraction of the time I used to take me. About a year later, that bank branch closed down. But you know what? The ATM still remained. “How ironic …,” I thought. That lady pushed me (and who knows how many other people) over to the ATM to do her job. And now the ATM is still here, but she isn’t. This got me thinking: Had that bank teller been a little more helpful, would the branch have provided a better service? Would they still be open today? Might she still have a job? For most people, there is nothing more devastating than the loss of a job. Their only source of income is suddenly cut off. Their livelihood at risk. That certainly wasn’t the last time I witnessed jobs being replaced by robots (if you want to call them that). In the decades to follow, the trend becomes more and more apparent. Technology is a bit of a double-edged sword. It’s supposed to make our lives easier and do the things that we humans don’t really want to do. For companies, its particular important because it can improve efficiency, increase throughput, and make fewer mistakes. But with each new technological advancement, something humans used to do becomes extinct. Their service becomes obsolete. I can think of several ways in which that has touched our daily lives. Why drive to an actual store when I can just buy it on Amazon? (How many times have you said to yourself “Hey! Look at that – this one ships for free with Amazon Prime! I’ll just get it in 2 days.”). Soon, drones will deliver our packages. So what then of logistics companies? Travel agents have been replaced by DIY online travel websites. Stock brokers have been replaced by DIY online discount brokers. Video stores have been replaced by Redbox kiosks and Netflix. Music stores are literally a thing of the past thanks to services like iTunes, Pandora, and Spotify. Even restaurants like Chili’s and Applebees now have tablets at each of their tables where patrons can order food or pay their bills – jobs that a server used to perform. In my home-state of Michigan, this has been a very stark reality to the entire automotive industry. Much of the 2016 presidential race was based on the promise of the return of manufacturing jobs. But the reality is that those specific jobs are never, ever coming back. Manual labor has been replaced by automation – robots took the jobs that real people used to because they can work around the clock tirelessly without dispute. Physical labor isn’t the only human service that technology has come to replace. In the recent NASA movie “Hidden Figures” (or any movie about the space program), you’ll notice that these places used to employ rooms of white-collared engineers performing scores of calculations by hand. However, all of that became obsolete once IBM computers came online and were able to perform those same calculations in fractions of second. But advancement is going to happen, whether we like it or not. So the only logical question we can ask is: What can we do about it? As I see it, there are really only two strategies we can embrace. The first is to realize that if your career is going to evolve, then you need to as well. It’s unrealistic to expect that the tasks you performed 10 years ago are going to be the same ones you will do today. This is largely thanks again to the pace of technology. Within a decade, most professional companies will change their software applications at least a handful of times. This of course means the way you will interact with these programs will be different. But this change can also go a lot further. In many respects each time technology renders an old occupation obsolete, it creates a new one in its place. Let’s go back to our earlier examples and expand upon them. Amazon will need an army of individuals to help them handle the logistics of their orders. Travel websites need to interact with databases of available flights and hotels, and someone needs to support this. Online discount stock broker programs have to proactively provide research and data in order to remain competitive, and someone will need to coordinate this. Redbox kiosks are machines that will require setup and maintenance; which someone must provide. Netflix will need to negotiate licensing and pricing with the major movie houses in order to have options to stream, and someone will need to make this happen. The options and playlists we find on Pandora and Spotify will need to be programmed by someone. The IT behind those tablets at the casual dining restaurants will need to be installed and carefully looked after. The use of robots in manufacturing introduces a whole new industry. There will be needs for people to engineer, build, repair, sell, and train on these devices. This reality is why U.S. Department of Labor predicts that 65% of children will be in jobs that have not yet even been created yet. The world is constantly innovating, and therefore none of us can accurately predict what it will look like in 10 years from now. So while your old job may be replaced by a robot, there is a high probability that you will be able to side-step into an entirely new one. The question we all need to ask ourselves is: What are we doing to be ready for it? How can we prepare and be ready for something when we don’t even know what it will be? My belief is that this can be achieved if we just keep an open mind. Be open to the fact that you may be asked to something tomorrow that you’ve never done before. Get accustomed to operating outside your comfort zone, and embrace the challenge of learning something new. Technological advancements are often rooted in our own personal short-comings. We look for machines to do the things that people don’t do very good or could do better. But our brains are still at least 30 times better than the any super-computer. We have the ability to innovate customized solutions for employers and the customers they seek to service. We need to focus on this talent and make it the core of our skills. For as long as we possess this, nothing can replace us. I think back to my opening story about the disgruntled bank-teller. Now of course I will never know why she was the way she was or why the bank branch ultimately closed. But I’d like to think that if she had been a little more inviting and helpful, this would have lent itself to much greater opportunities. She and the other tellers could have better promoted other products, loans, investments, refinance opportunities, etc. Just maybe … they could have provided something helpful to someone that they didn’t even know they were looking for. While we often think of speed and lower price as being major components to purchasing decisions, don’t underestimate the “people factor”. Lots of people shop in higher-priced stores or eat in nicer restaurants because they want that fundamental sense of human interaction. When we challenge ourselves to provide such service, we earn this loyalty, and that makes it harder for us to become indispensable. 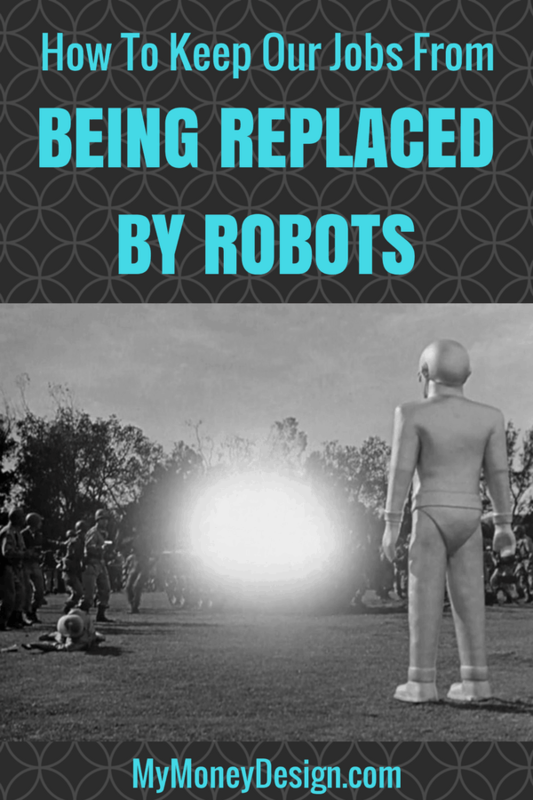 Readers – How have you witnessed robots and technology replacing our jobs? What do you think we can do to overcome the situation and preserve our employability? What Did You Learn From Working as a Teenager? The thing is that there’s nothing that that bank teller–or the fast food workers or the auto workers–could do to stop the replacement of workers with machines. Machines are just cheaper and more efficient in the end. They don’t get paid, they don’t take vacation, they don’t strike for higher wages, they don’t go to school on the side with the goal of getting out of their McJobs, they don’t need an entire Human Resources Department to manage, etc. Even the best workers can’t compete with that. I doubt anyone out there has the ability or willingness to work LITERALLY 24/7 without food, sleep, or a paycheck at 100% capacity. That’s the only way humans can compete. While the human brain is still superior to even the most advanced supercomputer, what good does that do a supermarket cashier? Any idiot off the street could do that (I should know; I was one of them). That bank teller had her own problems, and the branch was probably closed due to lack of profitability. But regardless, there was nothing she could do to stop the closure of that branch and possibly her job (if she wasn’t just transferred to another branch). Machines are just the superior workers. Look at the new career fields you listed in the rise of automation. Half of them are just maintaining the machines. But this is nothing new. Technology marches on. Precisely. I see the future of jobs as transitioning into maintaining machines, software, and anything else that took our old jobs. But the fact remains: A job will still be present. We just have to give up the old paradigm of what we think our jobs are (or were) and except the new reality of what they have become. Nice post. This fear of robots taking over our jobs is severly over blown. 200 years ago factory workers were destroying converyor belts and weaving machines. Like you said most of the jobs we are going to be doing in 20 years just don’t exist yet. Just think Apple, Google and Amazon barely existed even 20 years ago. I too witnessed the same jobs you mentioned above, and 1 day my teller recommended I download the Banks app so that I can take a picture of my deposit to avoid going to the bank. I Told her I prefer to come into the bank to save jobs, she blushed and smiled. So much is changing and education is lacking in helping people transition into those new jobs, unless you get a pricey 5 year IT degree. This is why saving to be FI is important. That’s a great interaction with your bank teller! I’m surprised that with the nature of IT that more training, degrees, or certification in this field aren’t being done online or remotely. I think content creation is going to become huge in the future. I think as more people have leisure time since automation should theoretically drive down prices. I think we’ll have more time to pursue our passions and unleash our talents on things we truly value. Should be a fascinating time. I’ve already seen a huge difference in just the past decade. 10 years ago I was still going to Barnes & Noble every time I wanted to find a book on some subject. Yes, there was the Internet and YouTube. But there just wasn’t as much content to browse through (or Google wasn’t smart enough to find it back then). Now I can find a webpage or video on even the most obscure topic. And as for Barnes & Noble, you can literally find a recently published ebook on just about anything you want to know more about. And most of the time it’s only $3. Information is definitely coming down in price! Interesting topic. Since I work in the technology field, it’s kind of exciting for me to know that there will always be new things to work on and innovations to be a part of. But in general, I think people will have to think more like management, to lead and direct the technology under them. In the past, there was a time when the majority of people served as farmers. Very soon the shift will be toward technologists. I also find the idea of a universal basic income that Elon Musk (and I believe Bill Gates?) have promoted interesting (http://uk.businessinsider.com/elon-musk-universal-basic-income-2017-2?r=US&IR=T), especially as we see more jobs getting automated like we do. Good comparison. I’m sure as technology develops and expands, there will be varying levels of involvement required or education required. Some jobs will be more routine while others will be more complex. But they will all be jobs in technology nonetheless. I’ve heard of Elon Musk’s universal basic income concept, but haven’t looked too deeply into it yet. Thanks for sharing the link; I’ll give it a read. I wanted to add- I don’t know if that was the source of the teller’s attitude-maybe she had just given up and was going through the motions (no excuse). I left because I became a ” floating” teller- sometimes working at branches 40- 50 miles away. Not worth it financially for me.